When it comes to getting the most power out of your engine, the devil is in the details. Paying close attention to how air flows into and out of your engine is an obvious place to start making modifications for optimal performance. A well-designed cold air intake and high-flow cone filter are great ways to let your engine breath better, but a filter on the end of a pipe has its limitations. If you’ve ever looked inside an intake manifold, you’ve noticed a curved “bellmouth” profile at the inlet of each intake runner. This bellmouth is added because it increases the efficiency of air moving through the pipe by as much as 70% in the right situations. 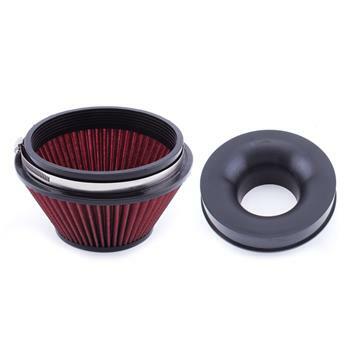 That said, the same sort of benefits can be seen by adding a similar bellmouth (in this case a velocity stack) to the end of your cold air intake. Included in each kit is a velocity stack, filter, and a hose clamp to connect the two together.